Amimoto WordPressStack greatly simplifies the development and management of WordPress hosting. WordPress is a content management platform that allows users to easily publish, manage, and organize a wide variety of content on a website. 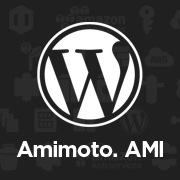 Amimoto Stack includes ready-to-run versions of WordPress. It is completely integrated and configured, so you'll be ready to start developing your WordPress as soon as the AMI is launched onto Amazon EC2. The AMI is a pre-configured operating system and virtual application software. All you have to do is to launch it! Nginx + Reverse Proxy Cache, and you can use the included WordPress plugin of Nginx Cache Controller GUI to control it!